Last Sunday I drove out to West Marin – a beautiful, sunny, spring day. 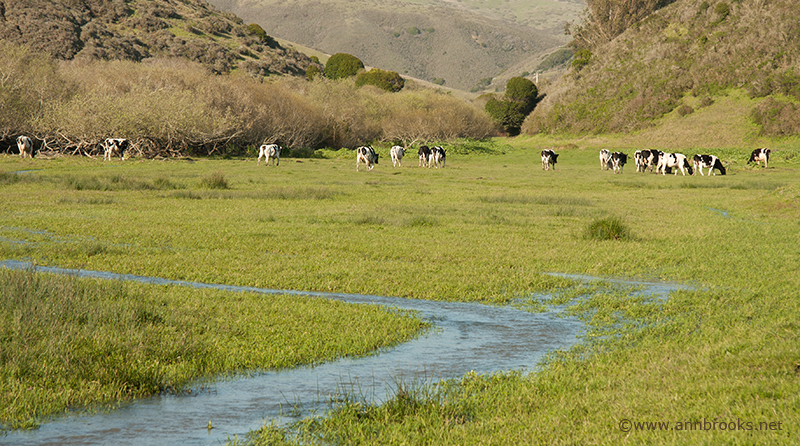 Traveling with my Canon 40D, my destination was the Cerini Ranch just north of the town of Marshall off of California Highway One. The Doughty family had opened their ranch to artists to come paint, sketch, photograph, or just be inspired, all under the auspices of Art On The Farm – every few weeks a different farm opens it’s gates for North Bay artists to come and practice their art. There had been recent rains and the hills were green. As I arrived, I was easily overwhelmed by the beauty of the ranch, it’s classic old buildings, decaying machinery and green rolling hills. I was challenged to decide what, in all this, would be my subjects. In the long run, the day turned out to be an important reminder to me that what I am drawn to photograph is people living their lives, objects relevant to human activities. Not just beautiful scenery. I’m a photojournalist at heart. Ultimately, only the three photos below made the cut. 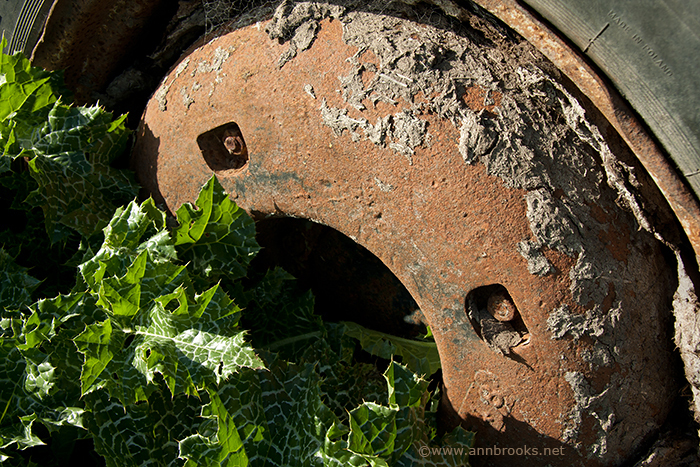 As I looked at the above scene, I made many photos of the old backhoe and the beautifully weathered barn. None really “spoke to me” until I got up close and personal, a reminder that I’m inclined to the more intimate approach, thistles, cobwebs, muck, and all! 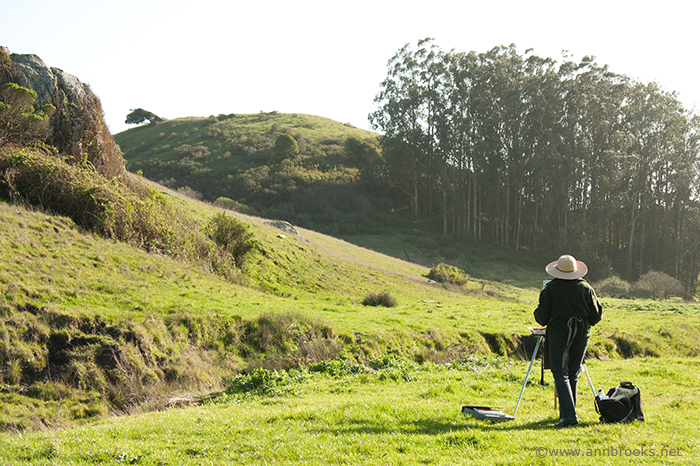 Late in the day, I couldn’t resist an artist painting the trees and hills beyond, which are so typical of this part of West Marin. Back down the hill at the gate, as I was heading home, the cows were heading home as well. Art on the Farm is a community-based, volunteer run partnership between artists and Marin Organic farmers. 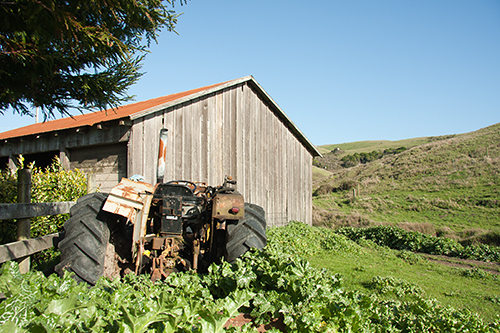 Art on the Farm was the vision of Bolinas farmer and artist, Alan Mart. It’s history goes back to 1998. I could stand it no longer! I took this image of bathers at the Ganges in Veranasi, India in 2005. I love it. However, I’ve never printed it before because technically it is a far less than perfect photo. Taken at 6:00 a.m. on a very overcast morning at ISO 1600 from a bobbing boat, it is not sharp and is full of digital noise. Ritual bathing at the sacred Ganges River in Veranasi, India in 2005. This week, three and a half years after taking it, I have given it new life. It is now available in my studio as notecards, prints and a canvas. Editing lesson from Kim Komenich, Pulitzer Prize winning photojournalist. I recently met with Kim Komenich, Pulitzer Prize winner and teacher extraordinaire, for his edit of some of my work. As a late-blooming photojournalist, I always learn a great deal from his comments. He explained that he was editing for a photojournalism story, beginning, middle, end. Komenich picked this image as a scene setter. It shows the peoples faces, is about who is there, we can see people we can care about. Additionally he singled this one out for it’s “staying power”, as being a powerful image on its own. I took these images in Oaxaca, Mexico on the 40th anniversary of the 1968 Mexico City massacre. Students, anarchists and others held a protest march keeping the memory of the massacre alive as well as protesting current injustices. Their message was “Ni perdon, ni olvido Mexico 68.” Neither forgive nor forget — the events on October 2, 1968. Here are Kim’s picks for the story with his comments. Above, though not a fan of showing other people’s signs, Kominech says this one is another way to set the scene, it tells why they are there. Image right, Komenich points out, “is full of little gifts”. There is a lot of activity, people reacting to the situation in a variety of ways. Image left, he sites for good design. On the right Komenich begins to drive home the importance of being able to see people’s eyes. The image shows lots of action and reaction. Below left, he points out, is a young man who isn’t “playing anarchist” as he surmises all the ones with masks are. He is the real thing and isn’t hiding. I remember working so hard to keep other people with cameras out of my pictures. Kim wisely pointed out that when it’s a “media circus” sometimes you just have to show it for what it is, lower right. To see the contrast between Komenich’s edit and my original edit of this story click here and check out the slide show. Big lessons here. Addendum: This morning, by the bright light of day, I see I missed posting the flag burner (right) that was Kim’s choice. He made a point of the fact that in this one you can see his eyes. Check out the pick in my original edit and compare how much more powerful the image is when you see the young man’s eyes. Yes, it is indeed very difficult to edit our own work. The New York Times online asked readers from around the world to send photos showing how the recession was playing out in our communities. In the San Francisco Bay Area’s Marin County, one of the country’s wealthiest, we are not immune. It’s been sad seeing small stores close along San Rafael’s Fourth Street. Here are images I found yesterday, on on main street, one on automobile row. On a personal note, as a long-time Prius driver, I certainly wasn’t sad to see the Hummer dealership close, and I don’t think any of us need expensive boutique clothes in these hard times. Leaves blow into the empty showroom where one of the country’s top Hummer dealerships is out of business in San Francisco Bay Area’s Marin County, one of the nation’s wealthiest counties. Marin County in the San Francisco Bay Area is one of the nation’s wealthiest counties but is not immune to the rescission, with many small stores struggling or going out of business on San Rafael’s main street. You can find both images and many more from around the world posted in the NYTimes.com Ecomomy section, one in the Business pile, the other in the Transportation pile. SF Bay Area Press Photographers Assn.